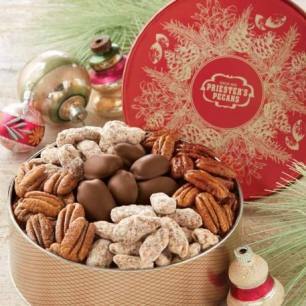 A handsome gift tin is only as good as what's inside, and this gift tin is great! 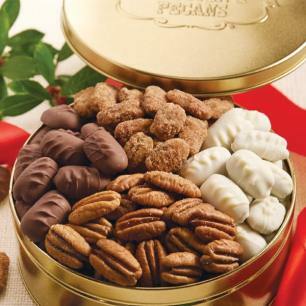 We've packed it with our finest pecan varieties and premium Roasted and Salted Cashews. 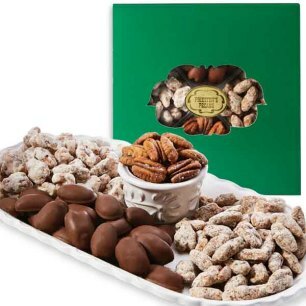 Ready to give or to enjoy, it contains plenty of Roasted & Salted Pecan Halves, Old Fashioned Cane Sugar Pecans, Praline Sugar Pecans, Honey Glazed Pecans, and Roasted & Salted Cashews. Loved the duck tin. Great Father's Day gift. Good selection, easy to order, timely delivery. Very satisfied. 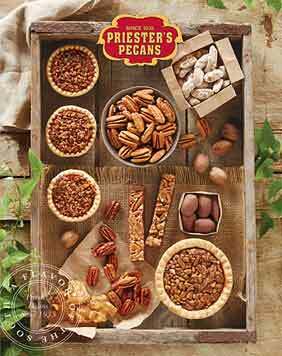 "Sweet & Savory Pecan Snack Gift Tin"